Gee it's been a great week if you like a little storm action with storms firing every day along the ranges. I haven't had a chance to chase anything until today. Kim and I headed out to watch the cells along the Blue Mountains this afternoon and we were treated to an awesome looking severe storm which backbuilt south west along the ranges before finally being overcome by outflow. Near the end we headed into it for a corepunch and were rewarded with very heavy rain, strong winds and even some small hail mixed in and the lightning was at times very impressive. Anyway i'll post photos when I can and I hope others were out there chasing as well. Tomorrow will see the action continue along the mid-north to north coasts and inland as a change moves in tonight. There is also the probability that we will see a small low develop off the coast. I would like to see how the storm looked from the front end glad you were there. Dave Nelson was on a storm near Hilltop - we'll hear from his storm later. I moved into the Bells Line Road to see what it was like towards Lithgow - saw it was not the best moisture wise so headed back towards the boundary. The storm had moved southwards backbuilding faster than I anticipated! I got footage of some intense lightning bolts and then later observed a funnel from the back end of the storm - good interaction. between the flash and the boom, which had that piercing hi freq. crack to them. here's a video still of one of the strikes WOW. and contineous lightning and thunder, from directly overhead. This storm was moving quickly to the NE and it wasnt long (~30 mins) before it had left the area. Was anyone videoing the squall line afterwards yesterday? It was awesome and definately the best i've seen in a long time. Trouble was I was at a party which started just as it hit Cranebrook. WOW Dave - I think WOW is an understatement! fantastic video still there. Any chance of posting up 10 seconds of video of that strike? The first storms of the day popped up after midday near Marulan and Bungonia. I was very tempted to try the Southern Highlands but I had a feeling the Nowra area would do well,so I decided to chase locally. A ordomary storm developed 15kms south of Nowra after 2pm delivering some heavy rain and some rather nice Cgs but not much structure.I was tempted to go after this storm at first,but another storm captured my interest over the escarpment just 10kms to my north with a nice dark rain free base. This storm developed quite rapidly. 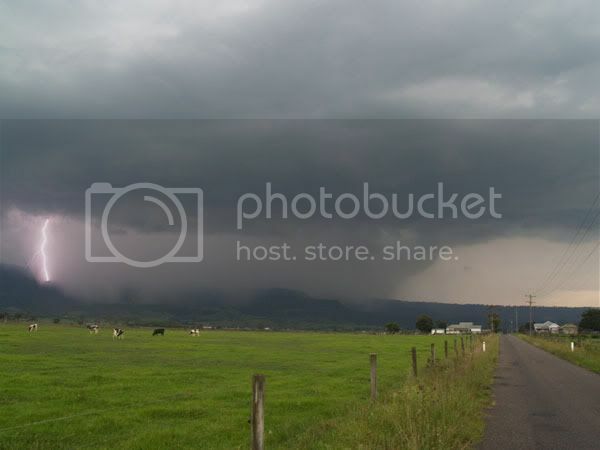 We went for a quick drive to the east of Nowra to get a better view.A shelf cloud/guster was starting to develop,and a heavy precipitation curtain was evident in front of the escarpment with a possible microburst amongst it as well. Some lovely CGs were touching just in front of the rain curtain about 2kms from us. The rain curtain started to close in quite quickly as did the bolt fest. 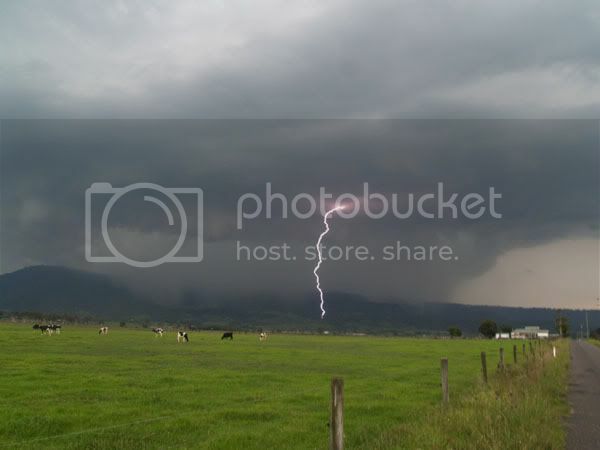 When the bolts started to get within half a kilometre it was time to get in the car. We only had a 5minute opportunity with the camera before we were forced into the car. We drove further eastwards towards the town of Shoalhaven heads and we kept ahead of the storm quite easily. We pulled over near Broughton creek for some more footage/photos. 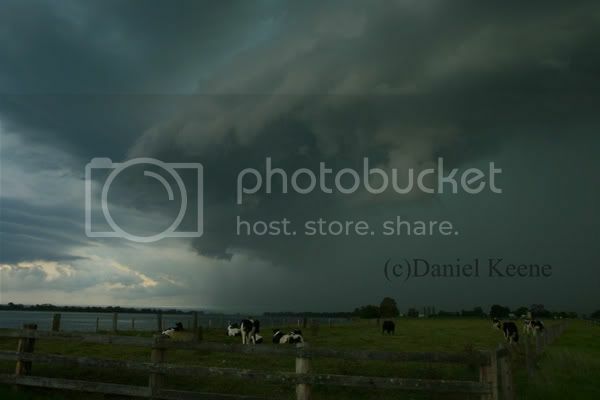 A lovely shelf cloud had developed,and the rain/hail shaft had a nice green tinge to it. Unfortunately we got rained in after this from a weaker storms and that pretty much screwed us. We had little option but to core punch the main cell encountering some very heavy rain 40kt southerly winds and some 2-3cm hail at one stage. Driving was quite dangerous with most cars pulling off to the side of the road. The flang fest was quite amazing as well with many bolts within 300metres and one hitting a tree in front of us 100metres away. The storm weakened quite quickly as it crossed the coast. After this we drove back home,just a 10minute drive.Mum and dad said the winds were very strong at home coming in from the north.Some tree damage was evident in parts of Bomaderry,mainly just large branches,but a fairly large tree was uprooted near my house crushing a car .The power was out until 9pm as well. A very interesting day! 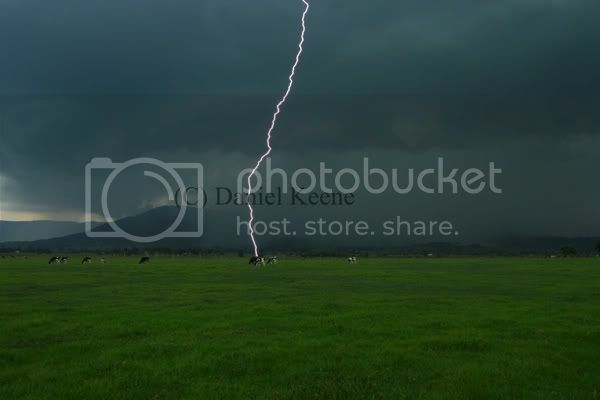 That is some excellent lightning pingtang and that shot with the branched bolt is as good as it gets. I think your choice for a coastal route and storm was a good one considering the scenery! Dave, you have had a an excellent few days chasing as well. Great to see others out there doing some exploration. 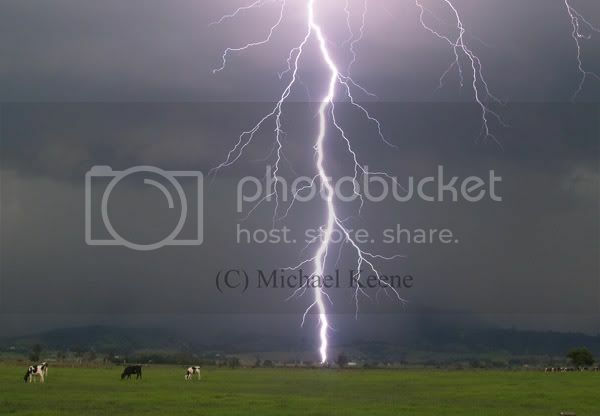 Hi Michael Keene : what camera settings were used for the staccato lightning above ? Pingtang - those photos are absolutely sensational....some of the VERY best lightning photos I have seen. Obviously that close bolt is the most startling, but those top two pics, with the precip blanketing the hills, the colours, the Cgs dropping out in front, the cows, the whole scene, are just awesome. Dave, I'm looking forward to seeing some video, just looking at that still!! Jeff, no video from me as I also had a function to attend. Just as I turned on to the M5 a Beverley Hills I shot 3 seconds of video from the car (around 6:00pm)....I was simply disgusted at the thought of having to head east into the city. It looked very ominous indeed even though it was 30km to the west. Saw some spectacular CC, anvil crawlers and CG lightning above while in the city (8:00pm). Pingtang, You guys continue to capture spellbinding storm sequences in your photos. The staccato bolt is a heartstopper!!!... a defibrillator might have to go in the camera bag as an essential accessory after that one. The colours are similar to using fuji velvia slide film, but only on digital format, very nice work. Jeff, looking forward to seeing your efforts off the ranges. As the storm front hit the Parramatta area we too had to be indoors attending a 21st. Well there was a lot more action outside than inside as that squall line blasted through. as some one else asked .... what sort of camera.. exposure settings etc ?? Thanks for the comments everybody I currently own an Olympus E300. This camera is over 2 years old now,so theres much better cameras out there. Having said that,the olympus does the job for me as you can see. It really picks up the colours well,whether its lightning or a sunset. I was very happy and quite suprised when I nailed that stracato. For your information,I was doing continuous shooting at the time,theres no way to react to straccatos anyway. I bumped up the F-stop to about F12 to give me a slightly better chance with a shutter speed of 1/40.The country side is nice and green at the moment as weve had 300+ mms this month and with the mountains and cows in front of us it was quite serene. A Storm Tracker shot as of 11pm. Fun for all on the coast. Tomorrow afternoon lets have a little development about Wilcannia so I can play to hey.